I'm a returning long time ORPer and noticing there is nothing posted in 2017 that I'm seeing. Is anyone still around? I just can't stay away. I think I'll kick over a few stones and see what I can find. I drop in from time to time to update my gaming status. Sad to see there are no games currently active. Ten years ago this place was hopping with gamers and new games. (sigh) I loved it! I'm working on a new game for the late fall > either 3.5 or 5E > will be dropping in and making notes on it from time to time throughout the summer. Glad to see my game forum is still up. Thanks for keeping it going! I miss the golden age also, and I miss more than a few faces from those days. Still, J has a game that is just starting up here so I say that counts as at least one active game . Hopefully yours will double that number! Well, I don't know about that. I am going to submit a forum request to work on the background of the game. I see a lot of people on the site > mostly visitors (about 50 as I type this) > wonder what they are looking for?? BTW...I just submitted my forum request! Both are computer programs that follow links around the web for various purposes - some legitimate (search engines use a lot of spiders to mine information from the internet) and others not so much (spam, mostly). Probably all of the bogus registrations we have on the site with spam links in their profile or that start spamming threads are bots. So this community is really dead? 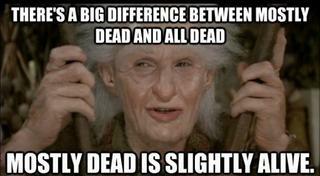 That depends what you mean by "really dead". If you mean "not terribly active" then yes, you are depressingly correct. If, on the other hand, you mean "entirely devoid of those who still care despite the oppressive solitude and plethora of ghosts from better times" then you'd be wrong. But only a little . And like I said in my game thread, I appreciate the admins for not closing this site. There are a lot of great gaming memories in here. I was home sick a few months ago and rewatched The Princess Bride - it's still great . And itches deserves all the thanks. I do love this place and all the awesome gaming I've been a part of here. May it some day witness a revival! I have been posting my current email game notes, but I confess the postings are few and far between, and I feel that most of my players either do not have the time or do not take the time to send a weekly post. Maybe they are really not interested in the game. Maybe I should have given them more input rather than choosing a module and running it. This forum used to be alive and kicking with dozens of games, new ones cropping up every few weeks, and hundreds of gamers. I have to wonder...what the heck happened? Did they give up on gaming? Did they discover other forums and move on? Did they move to "live" online gaming? It would be informative if folks would chime in about what type of games they are looking for, what they really want to play. What will it take to revive this place? I suspect a massive influx of new blood though I don't see how that would happen. I think the population has to be a certain size in order for the cycle of games to maintain itself. I did manage to bring in a few players but that ultimately had little effect on the state of this place. We have never really been a place that wanted to try and recruit people and "grow the brand", as it were. I do still harbor hope that someday a light from the shadows will spring . . . But yeah, it might be an age or two before the crownless again shall be king. For me, my friends and I moved to things like Roll20 or Discord (I also have a back-and-forth collab going in GoogleDocs right now). Chat RP like Discord can be handy and it's way easier in many ways than older programs like IRC, and Roll20, Fantasy Grounds, etc, give a real tabletop feel and function. Forum PBP has some benefits, like archival and lots of detailed description, but it's slow. Glad you are still gaming . PbP is certainly slooooow, and I agree that is a big factor in keeping games alive. That is not dead which can eternal lie, and with strange eons even death may die.